The key to saving for an anticipated expense or season of life (i.e. retirement) is starting early. The benefits of the concept of compound interest is well-documented, with the main difference-maker being time. Hypothetical Example: Bill starts saving $1,000/year when he gets his first job out of college when he is 22. Bill continues to save for 10 years until he is 32, a total of $10,000. At this time Bill’s twin brother Joe sees how well Bill has been saving and figures he better start saving so he saves $1,000/year starting at his age 32 until he retires at his age 62, or 30 years, a total of $30,000. 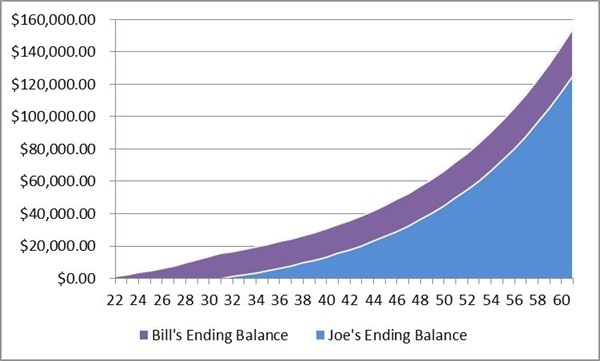 If an annual rate of return of 8% is assumed on each brother’s investment, because Bill started earlier than Joe, Bill still ends up with more money at their age 62. This is a hypothetical example and is not representative of any specific situation. Your results will vary. The hypothetical rates of return used do not reflect the deduction of fees and charges inherent to investing. Investing involves risks including loss of principal. Past performance is no guarantee of future results.